Hot Use: Heat therapy should not be used until 48 hours after an injury. Heat only when compress is at room temperature. Lay compress flat in a microwave oven on a paper towel or paper plate. Heat at full power for 20 seconds. If compress expands like a balloon: Stop heating. Compress is too hot. Let compress cool. Check for leaks. Remove compress carefully from microwave oven and knead to distribute heat evenly. Check for desired temperature (See Applying Hot Compress to Skin). To reheat, place hot compress back in microwave for 15 second intervals until desired temperature is reached. Knead compress again to distribute heat. 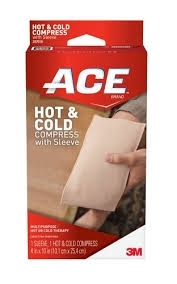 Applying Hot Compress To Skin: Insert compress in sleeve or wrap in cloth. Check for desired temperature by carefully placing covered compress against forearm. If too hot let cool. When comfortable, apply compress to desired area. Remove compress if it becomes uncomfortable. Cold Use: Cold therapy is recommended for the first 48 hours following the injury. Store cold compress in freezer for at least two hours before use. Applying Cold Compress to Skin: Insert cold compress in sleeve or wrap in cloth. Apply cold compress to desired area. Remove compress if it becomes uncomfortable. Do not apply far longer than 20 minutes at a time.